↑ Meyer-Rochow, Victor Benno (2007). "Glowworms: a review of "Arachnocampa" spp and kin". Luminescence 22: 251–265. ↑ Sala, Osvaldo E. (2000-03-10). "Global Biodiversity Scenarios for the Year 2100" (in en). Science 287 (5459): 1770–1774. doi:10.1126/science.287.5459.1770. ISSN 0036-8075. PMID 10710299. ↑ ၆.၀ ၆.၁ Lloyd, James E. (1989). "Ecology, Flashes, and Behavior of Congregating Thai Fireflies" (in en). Biotropica 21 (4): 373. doi:10.2307/2388290. ↑ ၇.၀ ၇.၁ Viviani, Vadim Ravara (June 2010). "Fauna de besouros bioluminescentes (Coleoptera: Elateroidea: Lampyridae; Phengodidae, Elateridae) nos municípios de Campinas, Sorocaba-Votorantim e Rio Claro-Limeira (SP, Brasil): biodiversidade e influência da urbanização". Biota Neotropica 10 (2): 103–116. doi:10.1590/s1676-06032010000200013. ISSN 1676-0603. ↑ ၈.၀ ၈.၁ Hagen, Oskar (2015-01-14). 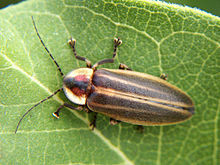 "Artificial Night Lighting Reduces Firefly (Coleoptera: Lampyridae) Occurrence in Sorocaba, Brazil" (in en). Advances in Entomology. 03 (1): 24. ↑ Firebaugh, Ariel (2016-12-01). "Experimental tests of light-pollution impacts on nocturnal insect courtship and dispersal" (in en). Oecologia 182 (4): 1203–1211. doi:10.1007/s00442-016-3723-1. ISSN 0029-8549. PMID 27646716. ↑ Owens, Avalon Celeste Stevahn (2018-02-07). "Short- and mid-wavelength artificial light influences the flash signals of Aquatica ficta fireflies (Coleoptera: Lampyridae)" (in en). PLOS One 13 (2): e0191576. doi:10.1371/journal.pone.0191576. ISSN 1932-6203. PMID 29415023.